The Strategic Cities Water Supply and Sanitation Project in Uganda has just received a boost from the African Development Bank (AfDB). The financial institution announced the release of $62 million to support this program, which will provide nearly 400,000 people with access to water and sanitation. The African Development Bank (AfDB) has announced the validation of a US$ 62 million concessional loan for water and sanitation in Uganda. This loan will finance the water supply and sanitation project in 10 strategic cities in the country; Kyenjojo, Katooke, Nakasongola, Kayunga, Busana, Kamuli, Kapchworwa, Dokolo. Bundibugyo and Buikwe. 390,000 people in those areas will have access to water and sanitation by 2030. “Demand for urban services far exceeds supply due to high urban population growth (5.4%), and insufficient investment in urban infrastructure and services. 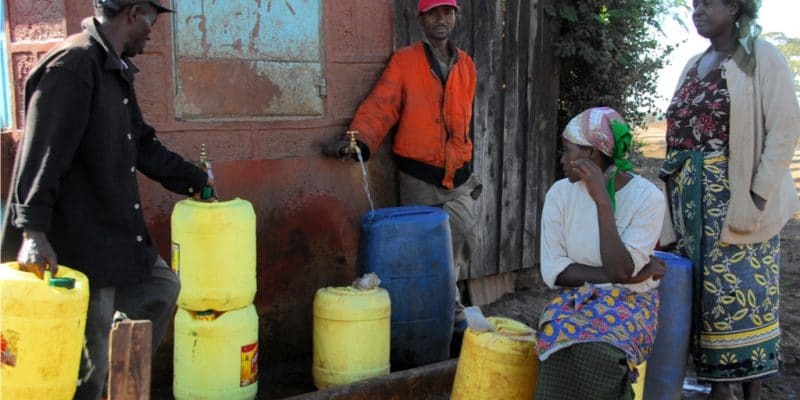 For example, the lack of sewerage management facilities has resulted in the discharge of untreated effluent, creating health risks such as cholera, particularly in underprivileged neighbourhoods in major urban centres,” the AfDB said. It is a project dear to the Ugandan authorities who are multiplying initiatives to enable its population to have access to drinking water. The strategic city procurement project will cost US$ 69.34 million, of which nearly US$ 62 million will come out of the AfDB coffers, while the Ugandan government will finance the remaining US$ 7.33 million. This sum will initially be used to set up three regional sludge treatment plants, supported by six emptying units. The authorities will also build 40 public sanitation facilities adapted to everyone (including people with disabilities). This project will develop the drinking water supply system in the 10 cities concerned by the project. The money will not only be used to consolidate infrastructure. Regional authorities responsible for water and sanitation management will be trained “for effective management”. Also as part of the training, “150 people will receive training on appropriate urban sanitation (masonry, mechanics, waste management), targeting at least 20% women. Sanitation and hygiene awareness will be conducted in 30 communities (targeting at least 50 per cent female participation) and will promote skills development for the economic empowerment of 200 youths and women. Finally, it should be noted that the supply project in strategic cities will contribute to increasing the rate of access to water and sanitation. For the record, in this country of great lakes, 24 million people have no access to drinking water, 29 million people do not benefit from sanitation services according to the NGO Water.